This week’s theme over at the Small Fancy is “Camping”. I had fun with this one. I miss my camping days. They ended when I met my husband. He generally does not enjoy the outdoors… bugs.. getting dirty. Not the makings of a good camper. He makes up for it by being awesome in many other ways. Fantastic illustration, Lori! So inspiring. Love it! I love this… it is for sale? let me know as i would like to buy it. 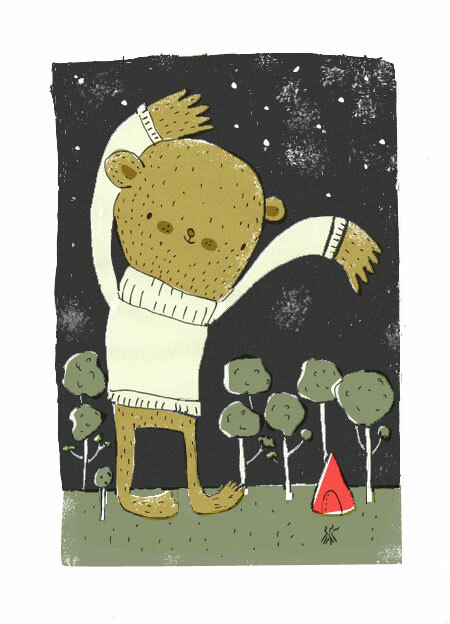 Ryan always wants to go camping and all i think of is the bears and they are going to get us in our little tent! this one isn’t for sale… but mia and i are working on settling up a Small Fancy Shop. i’ll keep you posted!